In the left column, click # Active Members. Scroll down if needed and in the right column, drag and drop # Active Members higher in the list. 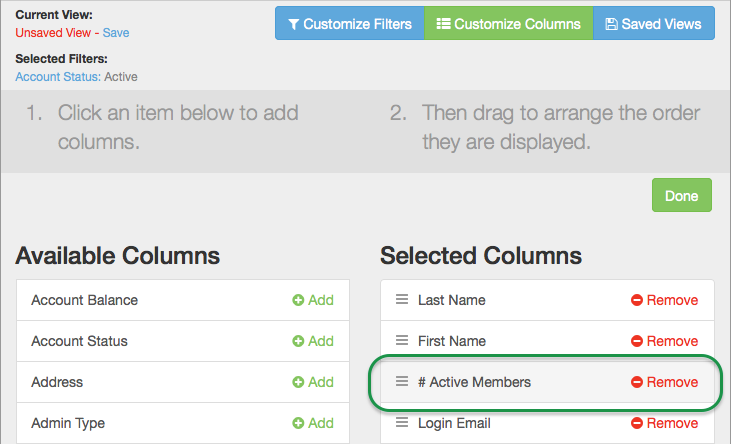 Click # Active Members column header to put all accounts with zero active members at top. Click the check box next to all account names with 0 active members. Click Edit > Multi Edit Accounts. Click drop down and change the Account Status to the desired level. How do I set an inactive date for a member to show when they will be leaving? Can I have a user defined field in account/member admin or in registration?